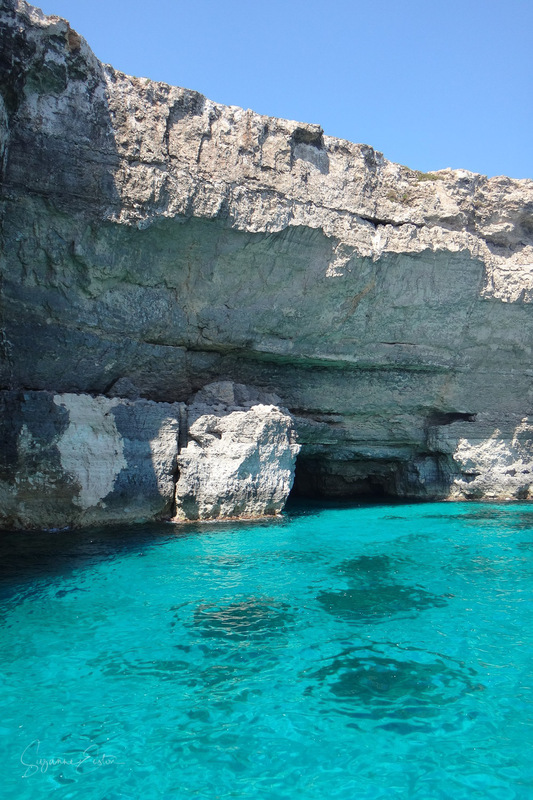 Comino - the “island of cumin”. Named after the fragrant herb that grows along its rugged rocky cliff tops. Quieter than Malta and Gozo except for the turquoise waters of the Blue Lagoon, it is a place to escape and explore. Leave the Blue Lagoon with its party boats and head along the coast, the dream for smugglers with the small inlets, coves and caves and the wild side of Comino is found. Santa Marija Caves were made famous as the caves in The Count of Monte Cristo, a 2002 film, and are some of the most interesting underwater caves that are easy to explore anywhere. On the surface the rock structures are spectacular, undulating with texture that gives the cliffs a distinct personality. However, below the surface they are even more stunning. The caves twist and turn with light reflecting off surfaces. Light dances along the cave walls, reflecting off the sandy sea floor and shards ripple through from the surface. Nudibranchs cling to coral and the tube worms appear and disappear as they sense the presence of divers. Fish shoal up the walls, sheer from the surface, a mirror image of their appearance above the water. Even though this is an easy dive the scenery and life on the reefs is far from basic.